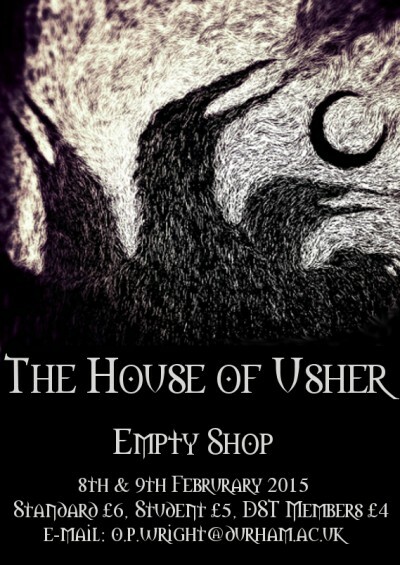 The promenade performance of The House of Usher at The Empty Shop could easily have been a disaster. And yet, against these expectations, it came off rather well. Blog regulars may have noticed I review very few student productions. When I’ve seen good student theatre, it’s been outstanding, but that’s a minority. Okay, I’m a strict marker, I don’t make allowances for not being amateurs, and at festival fringes I expect student theatre to compete with the professionals – but the fact remains that the good pieces of student theatre I see are considerably outnumbered by the mediocre, unfunny and horribly pretentious ones. So the only reason I went to see The House of Usher was curiosity. Ever since The Empty Shop got its souped up license in 2012, it’s hosted a few plays, a lot of it the overspill from the student Assembly Rooms. But so far, they’ve all used a single room as a performance space. With this one using the whole building, I thought I’d check this out. Had this idea simply been pitched to me, I would have been sceptical. Devised theatre is hard. Student productions very easily get out of their depth. They are usually guaranteed a large appreciative audience from all their friends, but local enthusiasm can be a bad thing. As for a promenade performance as complicated as this one – going straight into the venue without an practice runs with a practice audience is extremely risky. On the whole, there’s so many things waiting to go wrong, the odds were stacked against them. And they, this lot have defied the odds, and put on a very ambitious play that, whilst not perfect, comes off rather well. The Empty Shop is now a theatre space! Small bit of breaking news. I’ve known about this for some time, but it was only properly announced a few days ago. So, I can now tell you that The Empty Shop HQ off Framwellgate Bridge is now open to wider range of events which includes the possibility of theatre. This means that the Empty Shop effectively becomes Durham’s fourth space for performance after the Gala, the Assembly Rooms and the City Theatre. All this and more is possible due to a change in license term for the building. Not sure why there was a rule against this in the first place, but whatever the reason, it’s all change.